Massive Restaurants is considered a sort of benchmark in Indian Dining which implies huge expectations from Farzi Café. We decided to give it a try. Since we went during Ganesh Festivities, we decided to opt for all vegetarian dishes. By the time we started browsing through the menu, the Chef recognized that we were rookies at the Café. What followed was an interesting chat and we completely left it to the chef to surprise us with his choices from the menu. For starters he offered us a unique dish Dal Khichadi fry. Startled at first since I had heard of something like this for the first time, I was quite looking forward to trying out the dish. What was presented to us was rather unexpected. 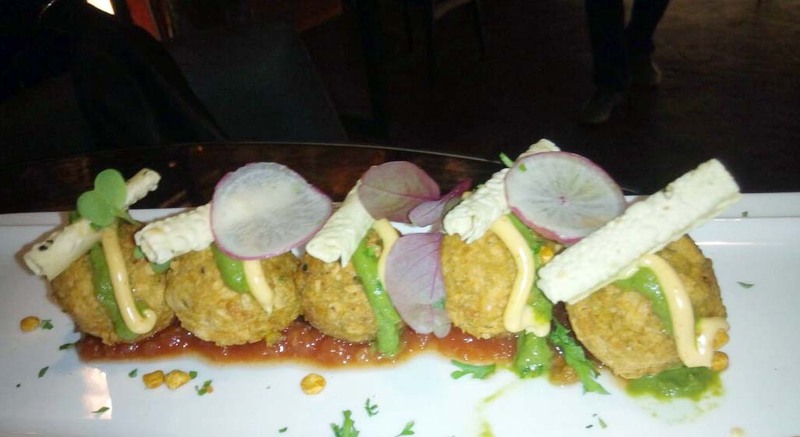 Dal Khichadi Fry was in fact perfect fried balls served on a bed of tangy, red chutney. It was a perfect combination of crisp and softness and the flavours exploded in the mouth. For the mains, the Chef suggested us Pav Bhaji and Appam. 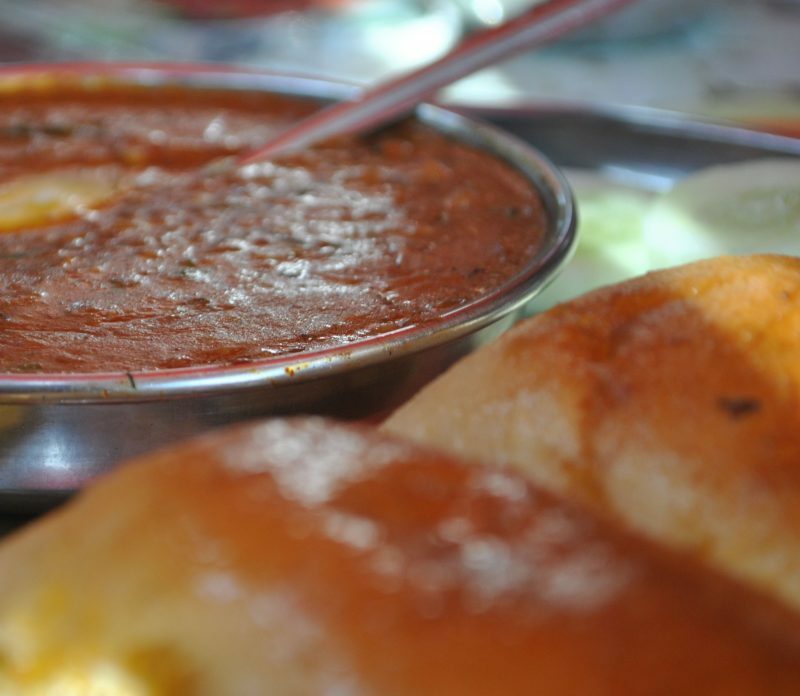 Now this was not a regular Pav Bhaji which we normally have. The Pav was focaccia bread, while the bhaji was made from exotic vegetables. Yet the chef had managed to restore the taste of the original Pav Bhaji. Since the Pav Bhaji was not typical, neither was its presentation. 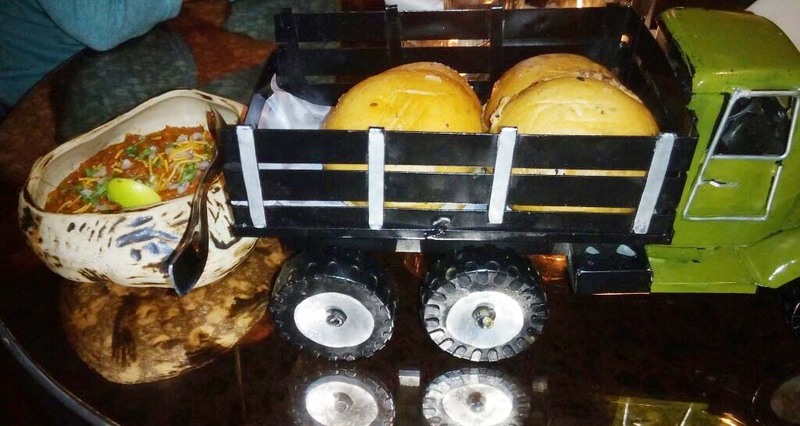 The Pav came in a mini truck, while the bhaji was in an attractive shaped saucer. The Appam was crisp and superbly made with a filling of Paneer Mutter. 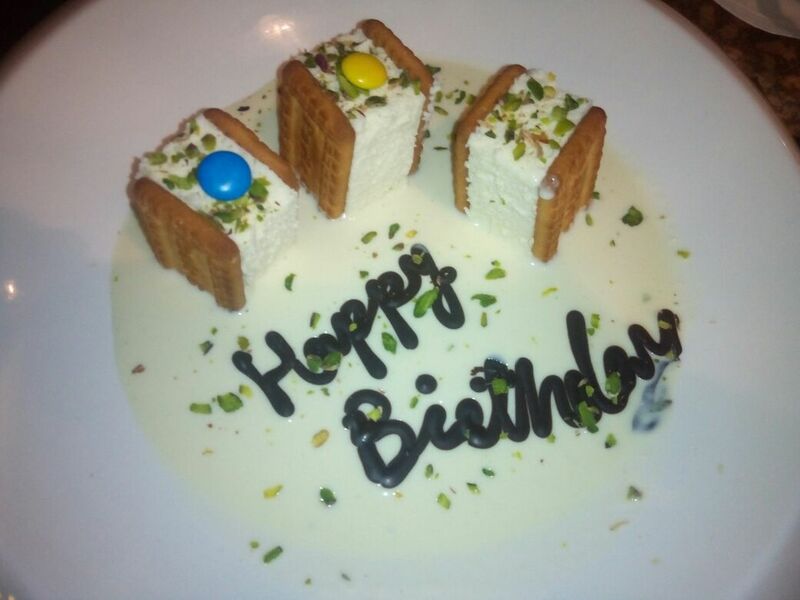 But then came the real surprise; the chef told us to keep some space for the dessert and he insisted on Parle G Rabdi. The dish was quite interesting with a cheese cake in between two Parle G biscuits and dipped in a really well made and sweet rabdi. In all it was a superb experience. At Farzi Café, even the bill isn’t presented in the usual manner. 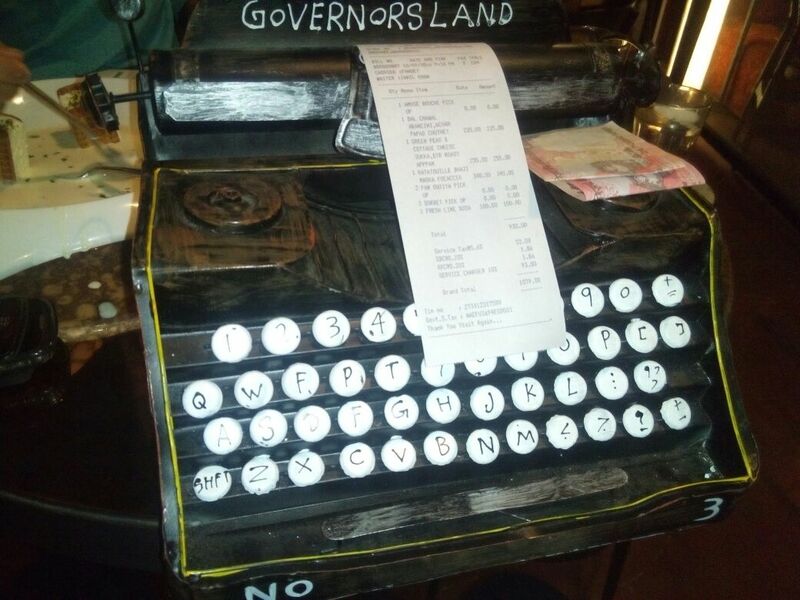 You are presented with a bill on a typewriter! 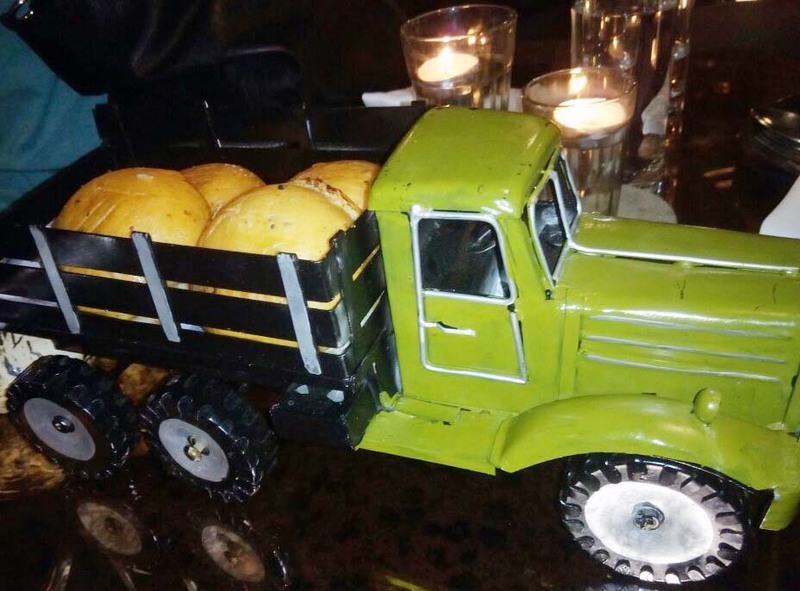 For the next time, the Chef also recommended us to try out their Vada Pav. He said that normally you’ll find Vada inside the Pav but at Fazi Café, it is exactly the opposite which makes it more interesting. We look forward to it. The food we had especially the Dal Khichadi fry starter, Pav Bhaji and Parle G rabdi were all innovative dishes served in a very unique style. Some of the signature dishes being Mini Raj Kachori, Sweet & Sour Pumpkin Mash with Chutney Foam, Tempura Fried Prawns with Nimboo Mirch Aire, Bombay Bhel, Version 2.0, Rajasthani Pyaaz Ki Kachori, Delhi Belly Tikka, Asparagus and Water Chestnut Kurma, Fresh Coconut Appam and the Revered Galouti Burger. Presenting an array of curated beverage options from its molecular mixology, are offerings such as Chuski Margarita, Farzi Apple Foamintini, Farzi Idea, Farzi OK, Chai-Pani and the entire BUNTA selection, to name a few. The staff was courteous and the Chef needs a special mention. The decor is good and overall Farzi Cafe in a few days of its launch has undoubtedly become one of the most happening places in Pune. Overall, with Farzi Café in Pune, one can be assured that molecular gastronomy and table theatrics will soon be seen in Pune in many places. Farzi Café does a good job in introducing this concept to Pune. We hear a lot of innovations in IT and other fields. But it is time we also recognize the innovations and experiments that some of the chefs and food chains are doing. Pune has built itself quite well in the IT industry and food is witnessing transformation now. To add to the contributors of the Pune food legacy, Farzi Café, a product of Zorawar Kalra’s Massive Restaurants has entered the scene. It serves right to the meaning of the word ‘Farzi’ which they say means ‘creating an illusion’. Previous Post: Jar it up!